Citizen scientists are helping birds dying at troubling rates in the Midwest by studying invasive species at Sleeping Bear Dunes. Volunteer divers study the effects that invasive mussels in Lake Michigan could be having on bird deaths at Sleeping Bear Dunes National Lakeshore. Photo © Emily Tyner. Ever wonder what lies beneath Lake Michigan? Emily Tyner, a graduate student at the University of Wisconsin-Milwaukee has been working for the past five years to find out. Her innovative new program harnesses the power of citizen scientists to study the relationship between aquatic invasive species in Lake Michigan and a troubling epidemic that is killing native birds at Sleeping Bear Dunes National Lakeshore. In the last several years, over 100,000 birds in the Great Lakes region—including the federally endangered piping plover—have died from botulism, a fatal disease caused by a nerve toxin. Researchers hypothesize that dead and decaying algae and dense populations of invasive species like zebra and quagga mussels contribute to the production and spread of the disease by creating a low-oxygen and high nutrient environment in the water where the botulism toxin can thrive. They believe shore and diving birds eat these mussels, as well as another invasive species known as the round goby fish, ingesting the toxin and contracting botulism. 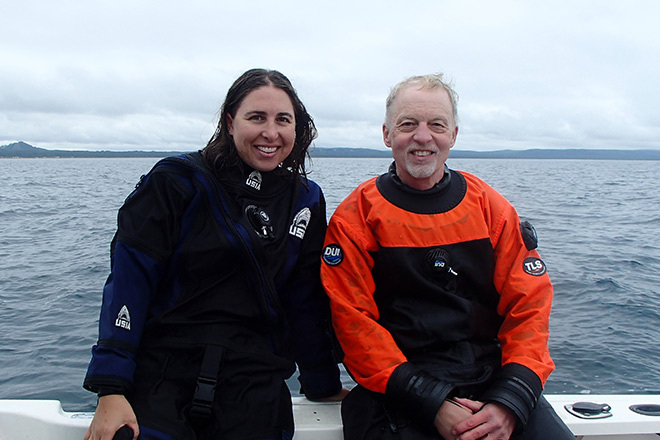 Emily Tyner and volunteer Ken Holzman go on a dive to count invasive round goby fish and to collect samples of algae and invasive quagga mussels. Photo © Emily Tyner. Through support from NPCA and critical federal funds provided by the Great Lakes Restoration Initiative (GLRI), scientists with the National Park Service, local volunteers, and agency and university partners are responding to the challenges at Sleeping Bear Dunes and making real progress. For the past five years, the park has managed a volunteer beach walking program to help collect and analyze shoreline bird samples, study the diets of these birds, and identify factors that drive botulism outbreaks. Since 2009, dozens of dedicated volunteers have spent more than 4,000 hours walking more than 3,500 miles of shoreline and contributing to the park’s body of research. 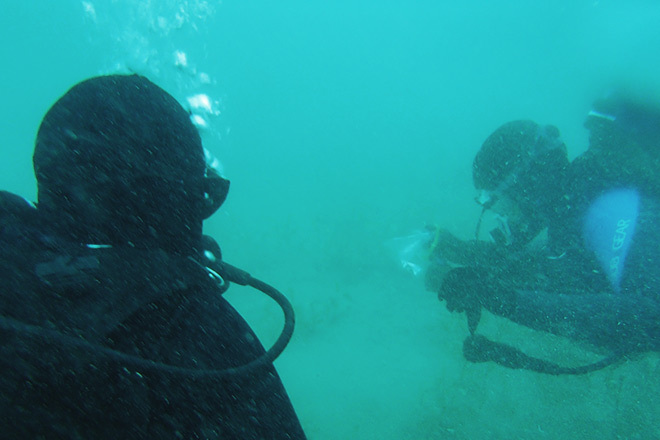 The program was so successful that Emily wanted to continue this work in the water, expanding the citizen science initiative to include a volunteer dive program. Count and measure invasive round goby fish. Clean and maintain underwater research equipment. Take photo and video documentation for research, education, and outreach. Collect algae and quagga mussels for chemical analyses to assess water quality. Participate in one dive per month from May to October. The Great Lakes are a unique national treasure containing nearly 95% of the United States’ fresh water and providing drinking water for 30 million people. The Great Lakes and their eight national parks support millions of dollars’ worth of commercial fishing, shipping, recreational, and tourism services that drive local economies throughout the region. Volunteer divers in Lake Michigan. Photo © Emily Tyner. The incredible work happening at Sleeping Bear Dunes is just one of many examples where GLRI funds are providing an enormous return on investment by supporting critical research at Great Lakes’ national parks. Members of Congress should continue to support GLRI funding so that we can continue programs like this that help preserve and protect the natural resources, native wildlife, water quality, and visitor experience of national parks in the Great Lakes. To learn more about the important work happening at Sleeping Bear Dunes or to volunteer, visit the Park Service website. Alison Zemanski Heis joined NPCA in 2010 and leads communications outreach for the Midwest, Northeast and NPCA's national water work. She also leads the communications outreach strategy in support of NPCA’s corporate partnerships and celebrity engagement efforts.